Pauline was having trouble sleeping. It was still dark outside, but she was wide awake. She slid into the garden, letting out a huge sigh as she sat down on the bench. She had until sunrise. Until then, she wouldn’t have to put a brave face on for anyone. She wouldn’t have to do anything. Just be alone. Pauline looked toward the direction the voice was coming from and froze. It was her mother, in ghost form. “If only I could paint it,” Astrid went on, as if this was a normal occurrence. She sat down beside her daughter. “Mom?” Pauline observed the ghost incredulously. “I… I don’t know. It’s not like I’ve had a lesson on how afterlife works,” Pauline let out a nervous chuckle. “I guess we’ll all find out someday, won’t we?” Astrid said solemnly. Neither of them spoke for a moment. “Well, I guess I should go.” Astrid said eventually. “Aren’t we making up now?” Astrid asked. Finally, for the first time since all the bad news had snowballed on her, Pauline let herself cry. “I’m sorry things turned out this way, mom,” she sobbed. The ghost suddenly turned a vibrant turquoise colour. And with one last wave, the ghost evaporated. The two women arrived at the cemetery. “So… you’ve done this before?” Pauline hesitated. “They don’t stay behind for their sake. They do it for us,” Yenn said wistfully. 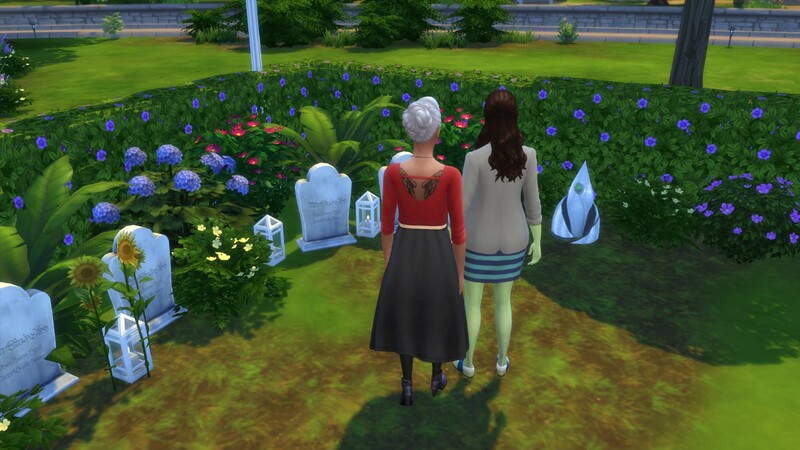 They looked at Astrid’s grave for a while. And with a deep breath, Yenn released the spirit. The spirit rose up into the sky. Perhaps she flew all the way back to Sixam. Pauline and Yenn would never know. “Thanks for being there for me, aunt Yenn,” Pauline hugged her aunt tightly. It didn’t feel quite right for them to leave right away, so they sat down at the cemetery. “I’ve tried my best. But it’s almost time for me to pass it on,” Pauline smiled with relief. “How have the ones before me chosen the next heir?” she asked Yenn. “I’m not sure if they did,” Yenn shrugged. “Monty made Astrid the heir because he was afraid he’d loose her forever if he didn’t try to tie her to this place somehow.” She shook her head. “Ok,” Pauline gave a firm nod. “Does this mean you have decided who the next heir will be already?” Yenn was surprised. They sat in silence. Yenn wondered how many hits the family could take. She examined Pauline’s face. It was filled with pain. And suddenly, it wasn’t. “The kids will be home soon,” Pauline said with a numb expression. “I’ll fix them up a snack,” Leo stood up. “I’ll go water the plants before they get here,” Pauline turned to Yenn. It was as if Pauline was on autopilot. Yenn understood it. She was trying to be strong for the kids. But surely keeping it all in couldn’t be healthy. Yenn, for one, could definitely not bury her emotions within on this particular occasion. Another Bloomer generation she’d outlived. One would think it would get easier with time, but it was quite the opposite. Of course she had been heartbroken when her parents passed away. And the pain seemed almost unbearable when her brother and sister left her in this world. But much like Pauline now, Yenn had to be there for Olivia. Outliving Olivia… now that was a particularly painful one. Liv had been like a daughter to Yenn. Yenn could only seek solace in guiding the next generation. It was a vicious cycle. Of course, Yenn had been dead herself when Liv’s son Monty passed away. So she somewhat cheated her way out of experiencing that passing. But now she was back, and hurting more than ever. And it wasn’t just because Astrid was the fifth Bloomer generation that Yenn had witnessed dying. It was because she felt like Pauline had repeated her mistakes. Not forgiving her own mother until it was too late. And now trying to hold it all within. And so Yenn wept; to release the pain that had been stacking up for generations. Of course, Pauline and Leo were lovely to her. Pauline would play the piano, Leo would read her stories… but they weren’t mom and dad. “Why me?” Hallie whispered through the sobs. “Why me?” A voice echoed from the other side of the room. Hallie rubbed her tired red eyes. Who was that? Hallie stared at the sad clown in front of her with an open mouth. “No, of course not!” Hallie said quickly. “That wasn’t because of you. My… my mom and dad died,” Hallie’s chin started trembling. “I don’t know,” Hallie said tearfully. This clown was the last thing she needed, Hallie thought. She needed to get rid of her, fast. “But I’ll never find you,” the clown welled up. Hallie snuck into Carly’s room. Luckily, her niece was already sleeping. She crept inside of the built in wardrobe and shut the door. Finally, she could mourn in peace. She started sobbing again. “Oh, hi Carly,” Hallie climbed out of the closet awkwardly. “Were you crying?” Carly sounded concerned. “Ooh, I just love playing in the closet,” Carly jumped out of bed. Hallie watched her niece disappear in the closet and then emerge again, with her arms mimicking a dragon’s jaw. “You don’t believe me? I’m going there right now!” Carly shut the closet door. Hallie stood in the room for a few minutes, unsure what to do. “And now I’m back!” Carly’s head peaked out of the closet door again. “Don’t mind her, she’s a weirdo,” Vito walked in. “Why are you in Carly’s room anyway?” Vito asked curiously. “A sad clown?” Vito raised his eyebrows when Hallie finished her story. “Yeah… she was making me really upset. It’s like… everything she says makes any kind of sad thoughts you have even more sad,” Hallie tried to explain. “We’re sorry miss clown,” Carly pouted. Hallie sighed. Now all of them were feeling down. “Clowns are meant to make children laugh, that’s why children love clowns…” the clown carried on. Everybody’s gaze immediately shifted towards her. Seraphina eyed the clown up and down, and then glanced at her upset siblings and aunt. “Me? No, why would I care?” Seraphina shrugged. “But… why am I not making you cry?” The clown asked, baffled. As soon as she said that, the clown disappeared in a puff of smoke. “How did you do that?” Hallie asked. “I’m the worst! Cry with me!” Seraphina joined in. The girls both started laughing. It was the first time Hallie had laughed since moving to Newcrest. Hallie dragged her feet through the doorway. It all seemed like a dream, but not a good one. 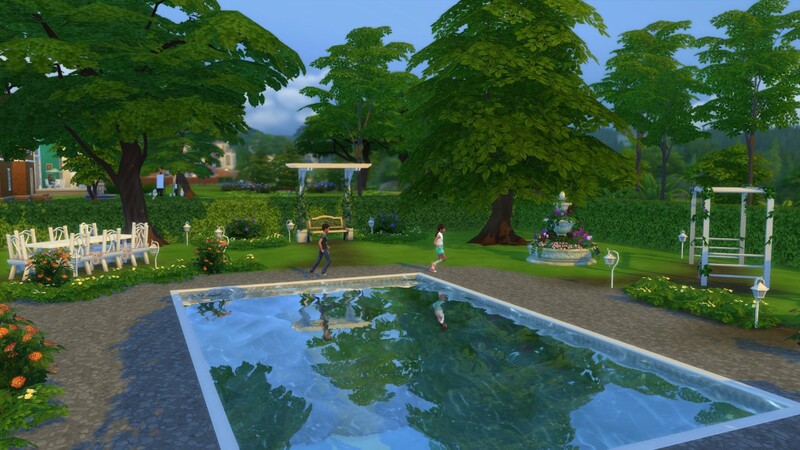 Her parents, her home, Windenburg… all of it seemed to have disappeared in an instant. She was in a strange house in a strange town, with relatives she barely knew. “You’re with family, sweetie. We’ll take good care of you,” the woman told her. Hallie knew Pauline was her sister, but she’d only really met her once, at Peyton’s wedding. And Peyton was her sister too, yet during the short time Hallie spent with her after her parents passing made it abundantly clear Peyton had no idea what to do with children. Which was how Hallie ended up here in the first place. She wondered where she would go next. Would she ever have a real home again? Hallie opened the door hesitantly. The room in front of her seemed nothing like her own room back at home. It was larger and brighter… but it looked foreign. And then she spotted it; her blue teddy bear from back home! Her heart skipped a beat. Maybe she wasn’t alone after all. Carly noticed her aunt’s voice sounded a lot more dull than when they first met, lacking its former vibrancy and energy. “Yeah, I was the scaredy cat,” Carly attempted a joke. “Now I’m scared,” Hallie let out a sigh. “We had a bunch of toys here, we’d play cards and don’t wake the llama; and best of all, we had a foosball table. We would play all the time,” Seraphina continued. “And then you had to come here and ruin it,” she suddenly starting yelling. “What, she just gets to come here and take over our playroom? And get a balcony?” Seraphina went on. “I’m sorry, ok?” Hallie threw her hands in the air defensively. She went on to hug her aunt. Seraphina opened her mouth, and then she closed I again. She turned around and walked out of the room. Carly and Vito peeked into Seraphina’s room the following morning. “Is the coast clear?” Carly whispered. “Aye aye, captain!” Vito confirmed. The two accomplices snuck in, and took over the doll house, giggling. “That’s kinda bad, Vito,” Carly hesitated. Carly and Vito jumped up. Seraphina was stood in the corner of the room, eyeing them up with a cold glare. “How… how long have you been here for?” Carly almost whispered. “We’re sorry Sera,” Carly said. “Yeah, real sorry,” Vito repeated awkwardly. Seraphina finished her breakfast and got dressed, but she still felt angry. She was pacing around the room. Why had everything changed so much? And now Hallie moved in and took away even that stupid playroom she had to share with her siblings in the first place. And those little brats seemed to hate her. But who needed them? Not her! And she’d make sure they’ll never touch her doll house again! The smile slowly left Seraphina’s face. Her beautiful doll house was ruined. Just like everything else. And nobody liked her any better. “You really are the worst sister ever,” Vito shook his head as he made his way out. Seraphina felt the warm tears sliding down her cheeks. She wasn’t sure if she was crying for herself, the dolls or even for Hallie and her loss. Nothing was right. And Seraphina felt powerless against it. “Looks like we got through another day,” Pauline breathed out. “I’m proud of you,” Yenn said softly. “Onwards and upwards, right?” Pauline forced a smiled. But it wasn’t Peyton. Neither of them was prepared for what lied behind that door. “What is that?” Pauline asked. She looked over and realised her aunt was crying. Pauline had never seen aunt Yenn cry. In her eyes, aunt Yenn was invincible. And now, strings of tears were pouring out of nowhere. “It’s an alien grave,” Yenn told her. “You mean, it’s like aunt Yenn’s stories about the criminals that lived in this house or ghosts?” Carly asked. “Oooh, I hope it’s about ghosts,” Vito jumped up. Leo wrote stories for his children often, and they always ate them up. Their excitement normally tickled him, but today wasn’t like that. He had a difficult story to tell. “Not quite exactly like aunt Yenn’s stories,” Leo said. “What about the ghosts?” Vito asked again. “There most definitely is a princess,” Leo nodded. “Lame,” Vito rolled his eyes. “What about if the princess had ninja powers?” Carly pondered. “Do you want to hear the story or not?” Leo asked. The children went quiet, all eyes on Leo. …there was a witch that lived in the swamps. “I thought this story was about a princess!” Seraphina pouted. The witch was young and beautiful, but she spent her days alone; brewing potions and practicing spells in her cottage. She did have to go to the market to stock up on ingredients for her potions sometimes. For the most part, she didn’t seek people in the kingdom though. And she was happy that way. Until she met the prince. The prince fell in love with the beautiful young witch, for he’d never met a woman like her before. He asked her to share his kingdom with him. The witch got scared; she’d always believed her magic was evil, and didn’t think she could share her life with a human. Not wanting her magic to hurt the prince, the witch ran away from him, back to her house hidden in the swamp. She decided to stay away from the prince for good. Her only reminder of the prince was a daughter born from their love. The prince searched for the witch for months, but was never able to find her, and eventually, he forgot about her. He still kept going to the place where they first met, but he could barely remember what he was looking for. What he did find there was a young princess, who he discovered to be both fair and kind. The prince found new love with the princess, a love stronger than his love with the witch had ever been. They soon married, ready to live out their happily ever after. But the witch was watching them. In spite of her best efforts, she couldn’t stop thinking about the prince, and so she observed his life from afar. Seeing the prince and the princess together crushed the witch. Feeling heartbroken and betrayed, she cursed them. Perhaps she didn’t mean to, but the prince and the princess’s lives would forever be affected by the witch. They went on to rule their kingdom as king and queen, and were good rulers loved by many. But there was one thing missing in their lives; the curse ensured they were not able to produce an heir to the throne. Meanwhile, the witch’s daughter grew up in the woods, unaware that her father was no other than the king of the land himself. She grew to become a stunning young woman of quick wit and many talents. But she was lonely. Wandering the woods one day, she came across a magic meadow. The witch’s daughter was mesmerised by the beauty she saw, and the serenity she felt. She almost didn’t notice a fae emerge from within a tree. “That she does,” the witch’s daughter agreed. “You do?” The witch’s daughter was in disbelief. The fairy led the bewildered witch away from the magic meadow, to the peak of the highest mountain in the kingdom. A gold green light came from within the castle and quickly started to spread. Soon, the warm glow was surrounding them. The witch could feel her body becoming lighter as the light embraced her. She was transported into the castle. The fae’s magic helped the witch’s daughter reunite with her father. And even the queen welcomed her with open arms. Seeing how the magic of the fae made everyone’s life better, the witch finally realised her own magic didn’t have to be a curse. It could be a blessing. And with her realisation, the curse lifted from the king and the queen. Although they were very old, the queen found herself with child. The king and the queen welcomed a new princess into the world. The princess was full of life, and her parents cherished her. Sadly, their own lives were nearing their end. And one night, the castle had an unwelcome visitor. He arrived alone, but took two souls with him when he left. The orphaned princess ran into the woods to grieve. Crying, she could barely see the beauty surrounding her when she reached the magic meadow. The fae welcomed the princess, eager to cheer her up. She was determined to take care of her and raise her as her own, now that the princess’s parents were gone. But the task was bigger than the fae could have imagined. The princess’s grief ran deep, and the fairy was unable to lift it. The fae realised she could not take care of the princess, for fairies are creatures full of light, not equipped to take care of human children with their worries and fears. The princess could not believe where the fairy took her. The swamps were scary, unfamiliar and unpredictable, surely filled with hidden danger. The princess was about to run away, when a woman opened the door of the cottage. “Are you lost, little one?” the witch’s daughter asked. The princess nodded, too scared to speak. The fairy watched the princess and the half-witch fall into a hug. Her own heart was breaking, but in a very different way. She knew that the princess and the half-witch needed each other now. Not to mention, the half-witch had a family of her own now. Children just like the princess. And most importantly, the fairy knew that with the half-witch, the princess’s life would never lack magic. “Don’t you guys get it?” Carly spoke up. “Hallie is the princess,” Carly said. The ceremony was short and sweet – both Peyton and Grady liked to get to the point. But the guests may have still been a little bit misty nonetheless. Hard to say whether it was due to the gorgeous surroundings, or the way the bride and groom were perfect for each other. “I will not have you two speaking like that! I won’t hear it,” Pauline clenched her fists. “It’s about time!” Peyton nodded happily. The newlyweds tossed out the portable DJ set and bar, reminding everyone once again that this was no typical princess wedding. All the guests, old, young, and young in spirit started dancing. Seraphina didn’t approve. Her wedding here would be way classier! “Hey, look at that!” her aunt Hallie pointed towards the piano. “Ugh, it’s those pesky ghosts, isn’t it?” Seraphina made a long face. “Vito!” Carly caught up to her brother, out of breath. “Weren’t you listening to the ghosts? They sad it’s bad luck to go to the maze at night!” she scolded him. “Lady Mimsy admitted she was lying,” Vito shrugged. “I know, right?” A boy with angelic blonde hair emerged from the mist. “You managed to get into the attic?” Vito was impressed. “Are you some weird sort of a ghost too?” Carly’s eyes widened in disbelief. “I don’t know about this, Vito,” Carly pleaded with her brother. “We’ll do it!” Seraphina cried out. “Does it matter? Nobody mocks the Bloomer family… or puts them to shame,” she glared at her sister. “Nice shmice,” Louis dimissed her. “Are you sure you know what you’re doing?” Hallie said nervously. “Quit following me, loser! Find your own way!” Seraphina growled. “I wouldn’t go that way if I were you,” Louis told Vito nonchalantly. “Or do… and see what’s there for yourself.” He laughed. “Just follow me you guys,” Hallie said with a sigh. “See, we made it! I told you it was a piece of cake,” Louis announced when the children finally reached the exit. “I only do what mom and dad say! I think our aunt is cool! I don’t deserve to be a Bloomer!” Seraphina imitated Carly’s voice. “Like I’ll let a baby lecture me!” Seraphina snapped back. Oddly, it was Louis who seemed the most panicked. Pauline led Hallie away, while Starr dragged Louis the other direction. The siblings followed their father in defeat, catching a glimpse of the ghost lord passing by. “I told you going to the maze at night was bad luck,” the ghost informed them. “All of you are right in a way,” Pauline told her children, amused. “The Von Haunt Chateau did have a noble lady and gentleman living here, kind of like a prince and a princess,” she nodded to Seraphina. “But there’s definitely a certain magic tied to the place, Carly. But the last guess may have been the most accurate – there are legends that the manor is indeed haunted,” Pauline winked at Vito as she finished her speech. “Cool,” all three children said in unison. The children didn’t seem quite as impressed with the last statement. “You look amazing,” Grady complimented his fiancé. “Isn’t it bad luck for the groom to see the bride?” Peyton arched an eyebrow. “If it isn’t the couple of the hour,” Leo greeted the husband and wife to be. “Who would have thought you of all people would go for the princess wedding,” Pauline teased. “You know me, ever the romantic,” Peyton said dryly. 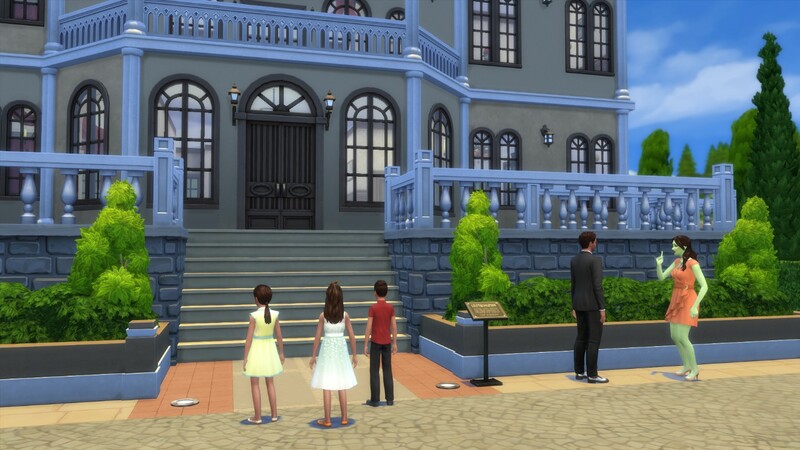 “I guess every little girl from Windenburg dreams of getting married in here, somewhere on a subconscious level,” Peyton continued with a grin. 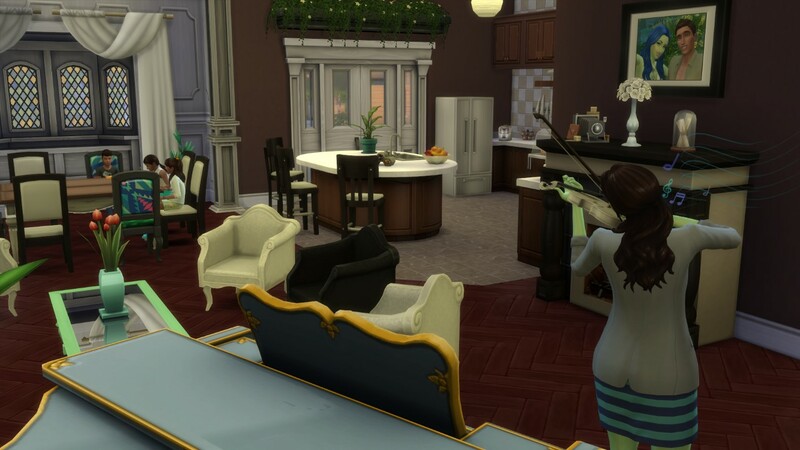 And by the looks of it, the rule didn’t only apply to girls from Windenburg. Seraphina was in love with the castle already. She decided that she’d have her own princess wedding here one day – of course, even more grand and impressive than this one. “Boo!” A figure emerged behind her. “I thought it was,” Vito giggled sheepishly. Carly shivered. “Is that a good idea? “Why should we trust you?” Vito asked sceptically. “And how do you know aunt Peyton?” Carly added. “Oh, I thought you were a baby or something,” Carly said. “I guess if she’s our aunt she would know more than us, right?” Vito hesitated. The Bloomer siblings were so eager to see the truth they almost left their guide behind. 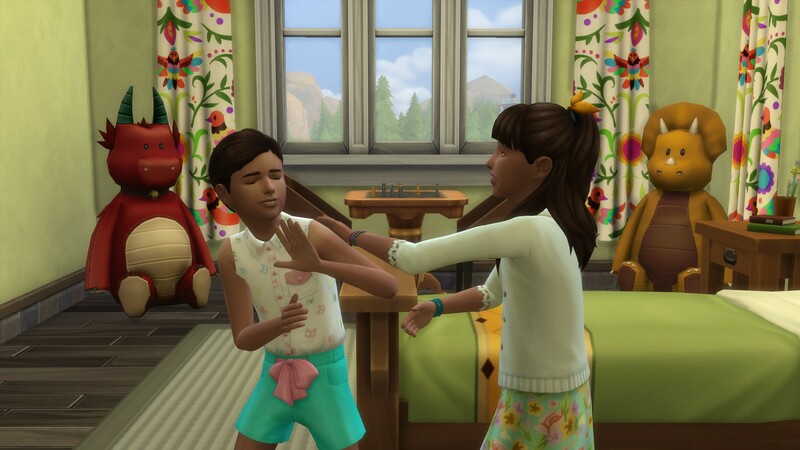 Seraphina stopped in shock, causing her brother and sister to bump into her by accident. “Nice to see you again, Hallie. Who are your friends?” the ghost acknowledged them. “How did you die, Mrs Ghost? Sorry,” Vito corrected himself. “You see the maze behind you, boy?” Lady Mimsy said in her best earie voice. All of their gazes turned towards the huge labyrinth surrounding them. The Bloomer children looked at each other nervously. Seraphina crinkled her nose. This was getting ridiculous. “But Seraphina, this is their home,” Hallie jumped in. “Do you have a prince in mind, for the wedding?” the ghost smiled, not acknowledging Seraphina’s tone. Seraphina was fuming. Carly wondered if it was possible for fire to come out of human’s nostrils – since her sister definitely didn’t seem far from spewing some. “Kids, the ceremony’s starting!” Pauline’s voice called out to them from the distance. “Let’s go, Vito,” Carly shook her head. The ghost watched the children walk towards the chateau. This was promising to be a fun evening. I’ve been nominated for the Spirit Animal Award – times three! The first nomination came from the delightful Ninjapigsims, the writer behind the lovable Alondra of Project L.E.G.A.C.Y. Ninjapig has also recently started a new legacy about the infamous Goth family (and also has more than another handful of stories on the go!). I have also been nominated by the lovely Derubelle! Her Life is for the Living Story is currently on a bit of a hiatus, but she pinky swear promised to bring it back soon. Last but definitely not least, I have also received a nomination from the amazing JoieWilder. Joie is best known for her Thoreau Legacy, a story I’m hopelessly addicted to, and also writes two casual stories, Crazy Town and The More the Wilder to “unwind”. Huge thanks for all of the nominations! I’m 28-year-old Czech girl (wait, do I have to say woman now that I’m nearly 30? Nah, I’m sticking with girl) living in the sunny Northern England. I live in a messy house with my boyfriend and three goldfish who are treated like royalty; their fish tank was actually intended for tropical fish. My job mainly involves writing web content and other comms, topped off with a bunch of randomness. In my spare time I like to play games (duh), get addicted to TV shows, sample craft beers and avoid going to the gym. Now on to the simlit part (does anybody ever really stick to just one paragraph?). 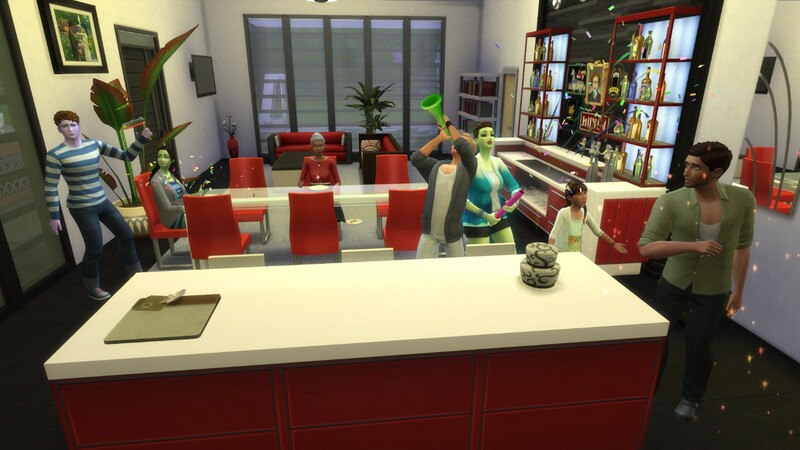 I’ve been playing sims for about 15 years on and off. That’s more than half my life, so yes, the game’s had a huge impact on me. Ever since generational gameplay was introduced, I’ve gravitated to legacy-style gameplay (although I have yet to complete a single one!). I started reading simlit back in TS2 days, when everything was still on the story exchange. The stories back then were hilarious, anyone who’s been around probably still remembers Don, the grilled-cheese obsessed zombie from Candi’s Uglacy. While I’ve been reading simlit for all these years, I was very much the silent lurker and never really attempted writing my own. That changed last year when I quit a job I hated and suddenly found myself with a lot of time on my hands. And so the Bloomer Legacy was born. When I was unemployed, the Bloomers helped keep me sane. Now I just keep going at it because I love it. While I’m lucky enough to get to write at work, this blog is my true creative outlet since I get to do whatever the plum I want rather than following someone else’s agenda. I used to write a lot when I was younger, but when “real life” took over, writing faded away from my life. Writing simlit has reignited this passion, and hopefully improved my skills along the way. All the while having a blast. I know a lot of simlit writers say they miss “just playing”. For me that’s never been the case, since I haven’t really changed the way I play. I just share it now. So if you’ve ever thought of sharing your own stories from your own gameplay (I’m looking at you, silent readers!) … just do it! I promise it only make it all the more enjoyable. Well, I checked back with my ultra long Liebster Award post since I’d gotten this question before, and this is what I said: Something that flies. A quiz I took said I’m a butterfly, but they creep me out a little. So I’d say some kind of a bird. Hopefully a colourful one! I think I’m sticking with that one! “Tabitha! I haven’t seen you in ages! What’s new?” Leo waved at his sister eagerly when he saw her walk past on his way from the diner. “Oh hey… I didn’t see you there,” Tabitha deflated. “Ok fine… I may have gotten a little bit married,” Tabitha said finally. “Well, we did click in the end,” Tabitha shrugged, defensive. “I don’t get it,” Leo looked at his sister, puzzled. Leo stared at her, speechless. The aftertaste of the encounter faded away quickly once Leo got home and was greeted by his little princess, Seraphina. “It’s not the worst thing in the world that your kids will have cousins close their age, you know,” Yenn told Leo later on. “So get to know him! Why don’t we invite them for dinner? Isn’t your birthday coming up? We should celebrate with a nice dinner party; I know you’ve been dying to throw a dinner party to show off your latest recipes,” Yenn winked. Meanwhile, Seraphina was in a world of her own. She had superpowers! Her parents were very lucky she was their daughter, she decided. Peyton and Grady were the first to arrive for the birthday party. Pauline tried to make small talk with them, but the lovebirds would barely take eyes off of each other. Luckily, Tabitha and her new husband Cygnus joined them shortly. “Look at you,” Tabitha’s gaze fell on Pauline’s heavily pregnant belly. “That will be me soon!” She realised, suddenly panicked. “Aunt Tabi!” Seraphina interrupted them. “Daddy was mad at you, but I made it all better because I’m the best,” Seraphina announced. “Looks like it pays to be on your good side, kid,” Peyton joked. “Ooh, I better get you a present for saving me then,” Tabitha exclaimed. “Trying a little hard to win the favourite aunt race, aren’t we?” Peyton smirked. Everyone gathered inside to sample Leo’s dishes. “So nice to get the whole family together,” Pauline said enthusiastically. “Especially the family you were not even aware of,” Leo muttered under his breath. She gave Cygnus an encouraging nod. “Well I am honoured to be a part of the family,” Cygnus said with a hint of uncertainty. Leo smiled. Time to leave the uncertainties and doubts of young adult years behind and accept adulthood with it all. And with that, Leo turned his attention to the birthday cake. Everyone in the room cheered; naturally Grady could be counted on to bring the vuvuzela. Seraphina just ran around trying to catch all of the confetti. She couldn’t wait for her own birthday, when everyone would celebrate her. But of course, that was still quite some time off, she’d only just aged up a couple days ago. The world really needed to focus on her more! Little did she realise the exact opposite was about to happen. The little girl peeked into her parents’ bedroom. “Hello, my beautiful princess,” Pauline gushed. Seraphina’s throat felt oddly dry. She was her parents beautiful princess! Seraphina approached the bassinet hesitantly. Seraphina observed the thing. It was drooling. Definitely not perfect, she shook her head. What did they see in her? Little Seraphina was showered with attention growing up. Leo took all of his family leave and extra days off to spend time with his little princess. And Pauline’s job was flexible enough to allow her to spend a lot of time with Seraphina anyway. Still, that didn’t mean she neglected her music; she’d play to her baby or jam with her aunt Yenn on any occasion she’d get. As for Yenn, she was happy to babysit whenever necessary. She felt grateful for every day she’d get to spend with the youngest of the Bloomer clan. Pauline’s support network allowed her to score yet another promotion. She’d never forget the first day she walked out the door off to play with the symphonic string orchestra for the first time. Mainly because it was the last day she’d get to play with them for a while. When the familiar nausea hit her mid-performance, Pauline recognised it immediately. The pregnancy test confirmed her suspicions, she and Leo had another family addition on the way. It seemed that she would need to put climbing the ladder in the music industry on hold for a bit longer. “Just imagine, another nephew or niece on the way! I’m not grown up enough for that kind of responsibility,” Peyton joked as she finished her frappucino. “I can hardly picture anything you couldn’t tackle,” Grady replied with confidence. Peyton loved her dates with Grady. And not just because he complimented her, or because it was an excuse to leave the house with a screaming infant. Though the two definitely helped. “You’re right, I am pretty awesome,” Peyton giggled. “And modest!” Grady added with a smirk. “It’s amazing what mutual hatred of fruitcake can achieve,” Grady nodded solemnly. Peyton’s eyes widened: “Well, if that’s what you want… I guess we can do that too. As long as we don’t neglect the fruitcake hatred. “Moving in together? Congratulations, what a huge step,” Leo smiled when Peyton told him the news. “Err…” Peyton looked away nervously. “But… but… you’ve only just moved back in!” Pauline pouted when Peyton broke the news. “You know me, a bird’s gotta fly,” Peyton laughed nervously. “I know. I understand… I guess it’s just the pregnancy hormones making me all emotional,” Pauline smiled weakly. 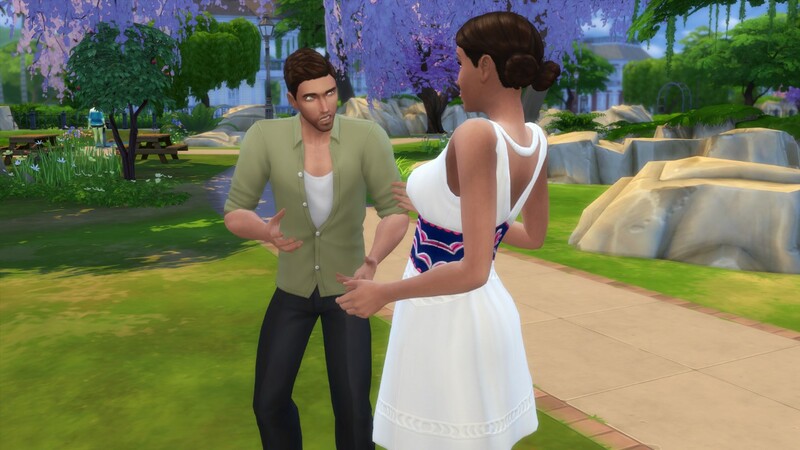 “My point exactly,” Peyton gently touched Pauline’s pregnant belly. “Your point? You mean that the pregnancy’s making me moody so you don’t want to live with me anymore?” Pauline sulked.